I have been a cartoon nut for a long, long time. I think it goes back to a time before I really have memories. I don’t remember a time when I didn’t know who Cat in the Hat was, or that Pogo was a possum and Albert was an alligator, or that Daisy Mae constantly had to chase Lil’ Abner afore they could git hitched. And I have always known that cartoons and comic strip characters weren’t real. But there were a few times in life when comic strips made me cry. Am I really that much of pansy that I wilt in the face of cartoon tragedy? Yes. Whole-heartedly! Take for instance Tom Batiuk’s long-running spoof of teenagers and life in high school, Funky Winkerbean. One of the first things that makes this comic special is that the characters have lives that expand into the deepening depths behind the daily gag and four-panel strip. They grow and age. Les Moore (the geeky kid with the dark hair and nerd glasses, the character I most identified with) grew up to become an English teacher in the same high school where he had to deal with the issue of teen pregnancy. Lisa, the girl he liked, was pregnant. Les helped her go through the pregnancy and give the child up for adoption, and then eventually married Lisa. Les would go on to raise his daughter with Lisa and then have to live with the fact that the child Lisa gave away wanted to find his real mother. The artist himself had a bout with cancer. He. like me, was turned into a cancer survivor. It chills the bones and changes you on the inside to have a doctor tell you that you have cancer and it is malignant. And it became a part of the story. Lisa became first a breast cancer survivor, and then… sadly… a victim. She died of cancer. Her husband, Les, took up the cause and started the Lisa’s Legacy Walk for the Cure which he pursued religiously every October. And Tom Batiuk made it real. You can donate real money to the real Lisa’s Legacy Fund. It is a cancer fund and fund-raising event that honors the struggle and death of a fictional character. It makes me cry again at this moment. They are real people to me, too, Tom. …And it doesn’t end with Funky Winkerbean. 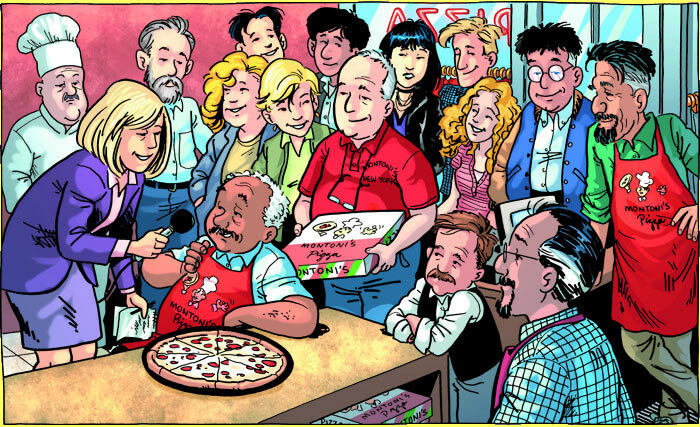 Today’s re-blog of Stories From Around the World’s post does an absolutely wonderful job of encapsulating the essence of Lynn Johnston’s family comedy strip For Better or for Worse. This engaging story of a family who also grows up, changes, and shifts from one generation to the next also tore my heart out with the un-funny episode where the dog, Farley, saves youngest daughter April from drowning and then expires from the effort, dying a hero’s death. Another memory that causes me tears even today. I do not regret reading comic strips. My life is richer for all the second-hand and third-hand experiences they have given me. Not just Popeye and Pogo and Beetle Baily making me laugh, but comic strips that make me weep as well. I loved Prince Valiant but had to wait for Sunday episodes and the action was not much action and would take 900 years to complete a story or a mere part of one. That’s the type of strip that was about the artwork. I also read Prince Valiant for the Hal Foster artwork. I got into Alex Raymond’s Flash Gordon for the same reason. I liked the stories that went with both, but you’re right. They would’ve been too slow to read if it weren’t for the fantastic detail and dramatic composition. I could look at Sunday strip by Foster for hours sometimes, long after I had absorbed every word. I need to laugh and cry a little sometimes, and this re-blog is a way to do both… a little.